The state of New York is famed for its cheese and the Finger Lakes region makes for a scenic and tasty destination to explore the wide variety of cheeses available in this special part of the Empire State. And, an organization called the Finger Lakes Cheese Alliance makes it easy to hit the trail and head into the heart of New York cheese country. Spreading like fingers across this lush region, the 11 deep lakes that make up the area provide a picture-perfect backdrop for farms, barns, farm stores, fields, vineyards, wineries, and more. 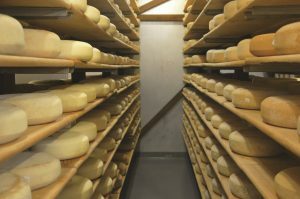 The Finger Lakes Cheese Alliance website (flxcheese.com), which includes a helpful map, makes it easy to plan a trip to one or many of its varied members. As is the case when planning any travel, it’s best to call ahead to any planned stops to check their opening hours and more (including where else to buy their cheese and other products). Each visit will be unique, possibly including tastings, tours, demonstrations, and shopping for cheese. The centuries-old basics for cheesemaking are relatively simple, with the labor, time, and storage involved providing an indication for why cheese—and especially artisanal cheese like that found in the Finger Lakes—can be relatively expensive (but, so worth it). Visitors to Alliance members will quickly become knowledgeable when it comes to how cheese is made through tours and conversations with cheesemakers. There are currently ten “destination farms” in the Alliance that are open to the public with varied opening hours. Generally, from the east to the west, these farms are: Engelbert Farms (Nichols); Side Hill Acres Goat Farm (Candor); Snow Farm Creamery (Brooktondale); Scheffler Farm (Groton); Lively Run Goat Farm (Interlaken); Sunset View Creamery (Odessa); Shtayburne Farms (Rock Stream); Parulski Farms (Bath); Hemlock Ridge Farm (Avoca); and East Hill Creamery (Perry). There are also two “production only farms and producers” that aren’t open to the public, except for special events or possibly by appointment. These Alliance members are Crosswinds Farm & Creamery (Ovid) and Heaven Scent Farm (Cohocton). Engelbert Farms near Nichols is a great place to start (or end) an exploration of Finger Lakes cheese and the region’s cheese-making and farming culture. A true family farm and farming on the same land since 1911, Engelbert Farms has been farming organically since 1981 and the farm has been certified organic since 1984—making them the first certified organic farm in the country. No chemicals are ever used on their land or animals. Owners Kevin and Lisa Engelbert (and two of their sons) are true emissaries of everything good about Finger Lakes cheese. The farm store features organic meats (beef, pork, and veal), lots of organic produce, and—of course—cheese. Choices of cheese can include feta, gouda, cheddar, and two Engelbert Farms originals—MooVache (a chevre-style cheese made with cow’s milk, instead of goat milk) and Moochego (a manchego-style cheese brined in organic brown ale). Each batch is made by hand and any additions are also organic. Just 20 miles north, Side Hill Acres Goat Farm up near Candor is next. Russell and Rita Kellogg established their goat dairy farm in 1987 and opened their goat cheese processing plant in 1994. 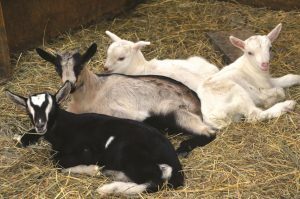 They feature more than 150 head of dairy goats and their popular tours give participants the opportunity to mingle with the goats, milk them by hand, and learn how cheese is made in the plant. Along with pasteurized and raw goat’s milk, goat milk ice cream, cheese fudge, goat milk soaps, Side Hill Acres cheese options can include aged logs (plain or with herbs), fresh buttons, herb cheese spreads, feta logs and crumbled feta, cream cheese, fresh mozzarella, mild cheddar, and more. Next comes Snow Farm Creamery, near Brooktondale, which is about 10 miles north of Side Hill Acres. The fourth-generation dairy farm now produces four different types of tasty raw milk cheeses, including gouda-style Dream Street, asiago-style Tiara, feta-style Fetish, and a young Swiss-style appropriately called Baby Swiss. They typically produce a batch of cheese (40-55 pounds) every Friday. Scheffler Farm, about 25 miles further north near Groton, is next. It’s a small diversified organic operation that features five varieties of raw milk cheddar cheese, including plain, garlic, Italian herb, hot pepper, and flavorful bacon cheddar. Lively Run Goat Farm, about 30 miles or so around the west side of Cayuga Lake, makes for another fascinating stop. They were pioneers in artisanal goat cheeses and remain at the forefront of goat cheese production and innovation. The widely varied options include chévre; feta; Finger Lakes Gold; Seneca Blue Moon; Cayuga Blue; Lake Effect Cheddar; Gorge Trail Gouda; Willow Hedge; Blue Yonder; and more. Tours include an informative video and their shop features their cheeses, as well as tasty cheesecakes, truffles, and more. Friendly Sunset View Creamery down near Odessa is about 25 miles south of Lively Run. The Hoffman family started farming five generations ago and it has been in the family since 1905. The creamery began in 2004 and owner Carmella Hoffman and her team produce artisan cheese using only their own milk. Sunset View features cheddars, Monterey Jack, cheese curds, mozzarella, Bel Paese, Havarti, and Heritage (a parmesan and Swiss blend). Along with continuing to offer signposted self-guided tours and opening a sprawling new retail store for the 2018 season, Sunset View will again host the fun Finger Lakes Cheese Festival on July 28th, 2018 (see sidebar). Shtayburne Farms near Rock Stream is less than 15 miles away to the northwest, near the western shore of Seneca Lake. Lorin and Alicia Hostetler and family own and operate the farm and it’s been in the family for four generations. They added a creamery and farm store in 2010. All of their cheeses (15 different blends) are made with fresh pasteurized milk and include varied cheddars and Monterey Jacks. Their flavored cheese curds are also particularly popular. The sprawling farm features rolling pastures, a working dairy farm, 60-plus milk cows, a cheese processing facility, and an old-fashioned country store selling their cheese and much more. Situated just north of Shtayburne Farms less than five minutes up New York 14, Glenora Wine Cellars provides a perfect example of Finger Lakes wine experiences that are available throughout the region while on the trail for Finger Lakes cheese. Featuring a winery, restaurant, and inn overlooking sparkling Seneca Lake in the near distance, the winery features varied tastings (they make a lot of unique wines), cellar tours, and sales of wine, cheeses, and more. Locally-focused and super-creative Veraisons restaurant is highly recommended for both lunch and dinner. Along with dozens of world-class wineries, the entire Finger Lakes region features many similarly creative restaurants that highlight local products, including cheese and wine. The next stop on this Finger Lakes cheese trail is Parulski Farms (northeast of Bath), which is about 25 miles or so from Glenora Wine Cellars, south of Keuka Lake. Here, visitors will find six cheddar and Monterey Jack cheeses, five flavors of cheese curds, and their two-year-old aged cheddar. They also sell meats from animals they raise on their farm, as well as other local products, like maple syrup, honey, jams, and more. Farm tours offered by friendly co-owners Rick Parulski and Meghan Delio are very popular here for good reason. Hemlock Ridge Farm near Avoca (and just 10 or so miles from Parulski Farms) is next. 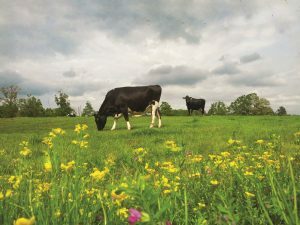 Situated on a windy hilltop south of Keuka Lake and certified organic since 2006, owners and operators Kelvin and Jessie Slayton raise calico cows on green pastures from May to October. 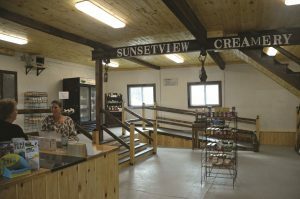 Their love of the land, crops, animals, and their growing family all contribute to a variety of delicious cheddar cheeses and more in their small farm store. The final (or first) stop on the drive, East Hill Creamery near Perry, is about 50 miles from Hemlock Ridge—but it’s worth the trip. East Hill is owned by Gary and Betty Burley, who has been dairying in the area since 1981. They started with 18 cows and now have more than 1,000. They’ve been making unique raw milk, grass-fed, cave-aged, alpine-style cheeses since just 2016. Along with heading to Alliance members that welcome visitors, their cheeses can also often be found in grocery stores, winery shops, and elsewhere throughout the Finger Lakes. That’s also true of the two Alliance production only farms and producers that don’t typically allow visitors or sell cheese at their facilities. Of course, there are several other farms producing cheese that aren’t members of the Finger Lakes Cheese Alliance (at least not yet). Along with cheese and wine touring , the Finger Lakes region offers a wide range of other activities. The possibilities include quaint towns and villages, varied attractions, culture, museums and historical sites, boat cruises and other lake-focused pursuits, other outdoors options (from hiking to biking and more), NASCAR racing and more at Watkins Glen International, varied restaurants, breweries, cideries, distilleries, and world-class wineries, other farms and markets, and lots of other shopping.